This week’s game spotlight is Quiz for Fortnite VBucks Pro by Noah Cremer. This cool quiz game is currently ranked #75 in the Top 100 Trivia Games category. It was ranked Top 100 in 16 other countries including Canada, UK, Australia, and Poland as well. Quiz for Fortnite is also ranked Top 100 in the Word Games category across 18 different countries. It’s been featured by China, Japan, Russia, Germany, and France in the Trivia and Word section. If you’re not familiar with the game Fortnite Battle Royale, it’s a popular co-op survival game published by Epic Games. It’s set on a futuristic planet Earth, plagued with mysterious radioactive storms. The goal is to be the last player alive (or team, if playing in squads) left standing. Players have to protect themselves from the storm and other players trying to take them out. For survival, players can use objects in the world to build things like shelter and traps. The game also features in-game currency called V-Bucks that can be used to buy improvements for your character, weapon skins, and other upgrades. It’s a very popular game with over 45 million players. Noah Cremer’s Quiz for Fortnite tests players on their Fortnite Battle Royale knowledge. All of the questions are based on the game’s rules, survival tactics, stats, and all the other key elements that make the world. To earn a high score, players have to answer each question correctly. In Quiz for Fortnite, one wrong answer and its game over. Players also have an opportunity to win free V-Bucks by submitting a new trivia question for the app. When you tap on the ‘Free VBucks!’ button you’ll given instructions on how to tweet your suggestion for a shot at winning. This game was definitely made for all of those trivia buffs out there. New questions are added to the app weekly. You can also compete against your friends’ stats to see who knows Fortnite the best. There’s an option to share your scores on social media too. 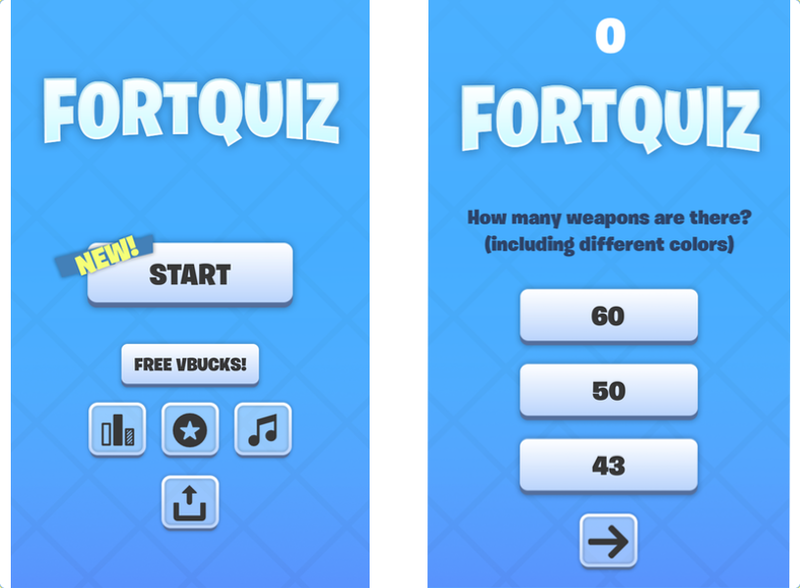 If you’re a fan of Fortnite Battle Royale and you love trivia games than Quiz for Fortnite is worth checking out! You might even snag some free V-Bucks. Quiz for Fortnite VBucks Pro is now available for download on iOS. We love to see our customers find success with their games. So, big congratulations to Noah Cremer on his game’s success. We’re always happy to see the games that our users make with Buildbox perform well on the charts.